Posh central defender Jack Baldwin in action against Preston. Photo: Joe Dent/theposh.com. 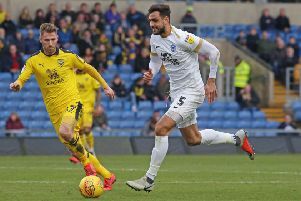 Peterborough United central defender Jack Baldwin reckons getting sent off 90 seconds into his comeback game was a blessing in disguise. The 22 year-old was on the sidelines for just over 12 months because of knee ligament damage when he was sent on for the final couple of minutes of Posh’s 3-0 FA Cup win at Burton in November. Jack Baldwin is sent off playing for Posh at Burton in the FA Cup. Photo: Joe Dent/theposh.com. It turned out to be a short appearance as Baldwin was shown a red card following a wild challenge. He wasn’t seen again in a Posh first-team shirt until Boxing Day when he was again employed as a late substitute, but he’s started the last two matches - big games at Sheffield United in League One and against Preston in the FA Cup - and shown outstanding form. “I was talking to the manager about things yesterday (January 11) and we agreed that getting sent off at Burton helped me,” Baldwin admitted. “I’d worked hard to get back into first-team contention, but getting suspended enabled me to build up my fitness for a few more weeks and the result is I now feel really strong. “I’ve played in two huge games and I’ve come through them well. The injury is completely out of my mind now. I don’t think about it when I’m training and I don’t think about it during games. I still have to do a little bit extra before a training session or a match just to get the knee moving, but I’ve been flying into tackles and there has been no reaction. “The work I’ve done in re-hab has made me really fit. The knee feels as strong now as it did before the injury. The hard training I’ve done has paid off so far. “It’s obviously great to be back playing again, especially as I’ve come back into a team that’s in great form. “We have a massive month ahead of us in terms of League One matches and I just hope I can stay in the team and help the side to close the gap on the teams above us. “We have a lot of good defenders at the club and we all know each other’s games really well, It’s our job to shut the door at the back so the attacking players can score the goals to win matches. “We’re always learning as a team. Because of the way we play, teams might start sitting back against us so we have to stay patient and wait for our openings. Baldwin was pleased with Posh’s fourth round FA Cup draw away to Bristol City or West Brom. He also hopes top scorer Conor Washington is still around to play in the tie on January 30. “Conor’s a great lad and a great player so if he gets a move away from the club then good for him.,” Baldwin added. “I completed my move to Peterborough on a deadline day so you can never be sure what will happen in a transfer window. “But if he stays then that’s good for us.